Cody Parker’s high-quality hops are chosen as the flavor centerpiece of seasonal beers from Hop Valley and 10 Barrel. West of Sutherlin, in an area of vineyards and farmland, sits a three-acre plot of fertile soil poled and trellised for the growing of hops. And these hops have a single, defining purpose. “We’re a boutique farm providing product for one- hundred-percent seasonal fresh-hop beer,” says Cody Parker, owner of Umpqua Hops and Melrose Vineyards, whose immense wine crop surrounds the hop yard just west of the Umpqua River. Parker grows Centennial and Cascade hop varieties for just two clients — Oregon breweries Hop Valley and 10 Barrel. When they are ready to harvest – late summer – the process happens the old-fashioned way. When the hops are added to the brewing process in their natural, full-cone state to make fresh-hop beer, some delicate handling and attention to timing is crucially important. That means instead of relying on machinery for the entire harvesting process, like a large commercial operation, Umpqua Hops does much of the work by hand. That’s because fresh hops are sometimes termed “wet” for a reason: Their moisture content can account for up to 80 percent of fresh hop cones in a bin. Add a little late summer heat, and it doesn’t take long for rot and mildew to start taking hold. Exposure also attacks aroma intensity and rapidly breaks down the alpha and beta acids responsible for the bittering and flavor qualities that hops impart to beer. It’s why brewers like 10 Barrel and Hop Valley will take the hops from bine to brewing tank before afternoon turns to evening. When it comes to hand picking, though, the first challenge to overcome is simply getting the bines down to the ground. It takes a little technique and a lot of brute force to convince the hops to give up their elevated vantage point some 20 feet in the air. Falling on one’s rear-end isn’t uncommon, especially among those new to the process. 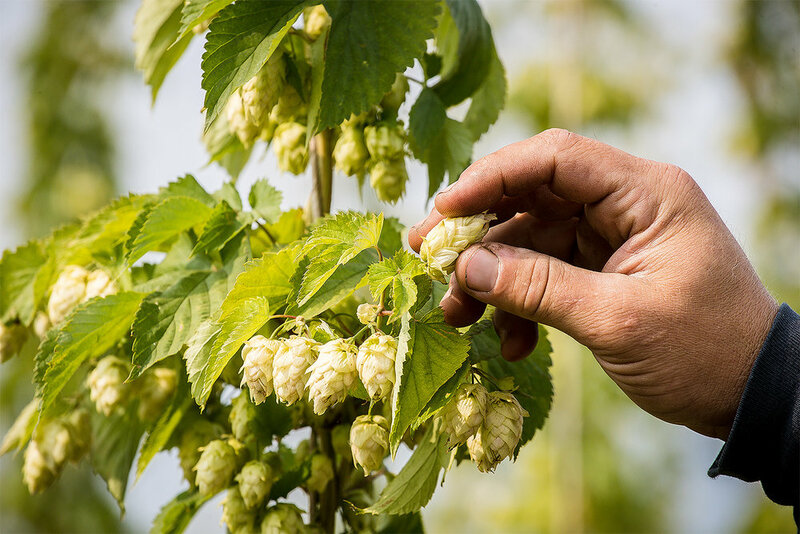 Once the waiting trailer is full of freshly plucked hop bines, it’s time to separate the hop cones from the stems, leaves and other vegetative material. This is where a little machinery gets involved as Umpqua Hops relies on a “Wolf” hopfenpfluckmaschine to help automate the separation process. At least 50 years old, the blue-gray behemoth had to be imported from Germany and survived being “bashed around” in the Caribbean by a hurricane before arriving at Umpqua Hops. Not only does the name sound like a fantastical creation from a Dr. Seuss tale, the contraption looks like one too. With a whirling and spinning combination of literally dozens of chains, belts, gears and pulleys attached to a mixture of conveyer belts and screens, the hopfenpfluckmaschine strips, explains Parker, as it sends the individual hop cones toward a waiting bin, while vegetation and debris spits out the opposite side to be used later for fertilizer. Standing near the bin steadily filling with fresh, fragile cones is like being in a beer-scented blizzard thanks to the flurry of hop vegetation and delicate petals filling the air. Umpqua Hops owner Cody Parker (left) and Hop Valley brewmasterand co-owner Trevor Howard toast their partnership. Late last summer, Trevor Howard—head brewer and co-owner of Hop Valley — drove from Eugene down to Umpqua Hops to get a first-hand look at the harvest and to personally transport 800 pounds of fresh hops back to his brewery to create two batches of seasonal Hop Fresh Pale Ale. Since fresh hops naturally vary a bit from year to year, the resulting fresh-hop beer is always a unique creation. Shortly after arriving back at the Hop Valley brewery, Howard loaded the fresh hops into the brewing tank so they could work their magic. Around three weeks later, the first batch of Hop Fresh Pale Ale (about 3,250 six-packs worth) was bottled and on the way to store shelves—with a bit of Umpqua Valley freshness infused into every waiting sip.